The Rev. Bill Stanfield sat in his living room recently, reading a book and listening as a group of boys passed by outside. He vaguely hoped the deep shouts of teenage bravado and exaggerated confidence wouldn’t wake up his wife and children. Then a car door slammed. He looked up from his book. The front door handle jiggled, as if someone was trying to get in. Stanfield’s house is on Success Street -- a name with an ironic ring to it, since it is located in the impoverished Chicora-Cherokee community of North Charleston, S.C. Heart quickening, Stanfield set down his book and slowly walked toward the front door. He swung it open. “Reverend Bill, you left your car lights on -- and your keys in the door,” said the young man standing in front of him. It was Kerionne -- a neighbor and one of the many young people who have been involved in Metanoia, the ministry that Stanfield and his, wife, the Rev. Evelyn Oliveira, founded in 2003. At that time, the neighborhood had the highest crime rate in the city of North Charleston, itself a regular on Congressional Quarterly’s list of the 10 most dangerous U.S. cities. The Chicora-Cherokee neighborhood also had the highest per-capita rate of child poverty in the state. Back then, the stories coming out of this community were not about success. Far from it. 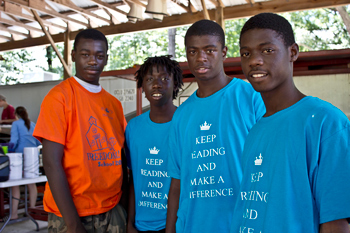 Ten years later, however, there are many such stories -- from the rehabilitated owner-occupied homes to the new Youth Entrepreneurship and Volunteer Center to the promising high school graduates, such as Kerionne, who have learned business and leadership skills and are pursuing postsecondary education. One of the most inspiring stories is that of the Metanoia Community Development Corporation itself -- the faith-based, community-led, asset-driven community development organization that Stanfield and Oliveira founded, which has been a catalyst for much of the change in Chicora-Cherokee. Metanoia has successfully expanded its programming, its scope, its staff and its funding over the years, managing to uphold its mission and its core values. By focusing on strengths -- both in the community and in the organization itself -- it has created a sustainable model for facilitating change over the long term. “I really do believe in this organization; I believe in where it’s going,” said Tony Joyner, who has lived in the Chicora-Cherokee neighborhood for 27 years. He served as Metanoia’s first board chair and has worked as the organization’s housing director since 2006. “It’s been a rewarding experience to see the progression of the organization and the changes it’s made in the community,” he said. The key to Metanoia’s sustainability was established from the beginning. When Stanfield and Oliveira first moved into the predominantly African-American neighborhood, the fresh-faced Princeton Theological Seminary graduates -- he, a white native of Greensboro, N.C.; she, a Brazilian-American whose family had moved to Landrum, S.C., when she was 10 -- were charged with fostering a relationship with community members. As urban ministers for the Cooperative Baptist Fellowship of South Carolina’s Charleston Poverty Initiative, Stanfield and Oliveira had a commitment of support from CBFSC of $120,000 a year for three years to establish an asset-driven approach to community development. The couple embraced the responsibilities with enthusiasm. In their first year, they sought out interested community members and set up an advisory board to identify concerns and assets. They joined and became involved in St. Matthew Baptist Church and bought a home in the neighborhood. What difference would it make in your life and ministry if faithfulness was your measure of success? How do the core values of your organization contribute to its sustainability? What are the unchanging things that you will not let go of, even for $1 million? What are the most critical challenges facing your community? What are its greatest strengths in addressing those problems? What would happen if you asked those same questions about your organization? By joining St. Matthew, and practicing disciplines such as taking time during lunch every day to pray for the community and the ministry, Stanfield and Oliveira established an initial spiritual commitment that has paid dividends in the long run, said Porter, who specializes in the history and theology of Christian mission. Indeed, that initial year was fundamental in shaping the focus of what would in 2003 become the Metanoia Community Development Corporation. “The initial expectation of improving the fortunes and prospects of some poor children has become a ministry that is bringing transformation to an entire community,” said Jay Kieve, the coordinator of CBFSC. Metanoia is rooted in a theology of the kingdom of God as expressed in the ministry of Jesus Christ, who called everyone to a “metanoia” -- a push toward something better, a positive change. That idea of pushing toward something better with understanding is fundamental to the organization’s community-based approach, and it explains why Stanfield -- now the organization’s CEO and an associate minister at St. Matthew Baptist -- insists on doing the work from within the community. The problem with social work that approaches a population from the outside, Stanfield said, is that the well-intentioned outsiders make assumptions about the people they are trying to help, the problems they are trying to fix and the solutions they are trying to impose. This is why, when putting together an advisory council in those early days, Stanfield and Oliveira selected community members with a long history in the neighborhood. And Metanoia still relies on its Council of Advocates to build support. In fact, most members of both its Board of Directors and its staff live in the neighborhood. The organization’s autonomy is critical in community-based models of community development, which follow the iron rule of trusting people to come up with their own solutions. It’s a crucial difference from charity-based models that don’t necessarily empower communities. Start with strength. That was Stanfield and Oliveira’s approach from the beginning. As they got to know the Chicora-Cherokee community, the couple drew inspiration from sociologists John McKnight and Jody Kretzmann, founders of the Asset-Based Community Development Institute at Northwestern University, who argue that the most efficient and effective way to heal a community is to focus on its strengths. That approach was the genesis of Metanoia’s first programming initiative, an after-school program for students who show leadership potential or academic motivation. Young Leaders was launched in the fall of 2003 based on the community-defined strengths and goals. “Focusing on the best and brightest students has been very important for gaining and enhancing their reputation in the neighborhood, because it’s this self-perpetuating cycle of success,” Porter said. As the Young Leaders grow up, student volunteers from the College of Charleston continue to work with them, focusing on character education, entrepreneurship and financial literacy. “It’s all about finding the bright spots,” Stanfield said. From its initial focus on youth, the organization quickly began to expand into other enterprises. Having identified vacant homes as a community asset, Metanoia began purchasing, rebuilding and selling them to first-time homebuyers. In 2008, they organized the renovation of two vacant duplexes owned by St. Matthew Baptist Church, to be used as housing for local students and interns working in the community. Of course, fixing up homes doesn’t do a thing without people to live in them. So in 2008 Metanoia began its financial literacy programs, including a creative collaboration with Atlantic Bank and Trust designed to help folks during the depths of the subprime mortgage crisis. It did the trick for Lisa McLean when her pre-qualified application was rejected. “I knew as soon as I called them that I was in good hands. I felt like I was really blessed. They made the home-buying process so much easier and smoother than when I was with the realtor,” said McLean -- who, based on her home-buying experience, decided to get involved with Metanoia. She is now the board chair. Metanoia’s economic impact also is being felt across the community. A 2010 study estimates that $1.5 million will go to local employees and businesses and 3.6 jobs will be created annually over a 10-year period. Public murals and a community garden have also engaged and uplifted community members. One way the organization is doing that is by creating as many opportunities for community input as possible. For example, at a town hall meeting last spring, stations were set up for residents to identify what is working and not working in the neighborhood by placing different colored flags on maps. And, it turns out, there are little bright spots shining everywhere you look in the Chicora-Cherokee neighborhood. Metanoia’s approach to its own sustainability focuses on assets as well. And its greatest strength, Stanfield said, is its commitment to its fundamental values: remaining community-based, asset-driven and rooted in faith. No matter how much the organization grows, those core values are always the guiding force. Fortunately, Metanoia has not been tempted to compromise its core values, thanks in large part to the CBFSC, which continues to support the organization with $100,000 per year. Aside from support from the CBFSC, another key to Metanoia’s financial sustainability is its diverse funding sources. From local governmental and nongovernmental grants to individual and corporate donors to annual fundraisers such as a jubilee banquet and golf tournament, Metanoia is not overly dependent on any one source. And what they do have is faith, along with a definition of success that is based on faithfulness, not outward measures. From transformed streetscapes and decreased crime rates to improved police-community relations and increased community involvement, Metanoia is slowly creating success stories throughout the Chicora-Cherokee neighborhood. “I did not take the initiative when I was younger. I wasn’t focused on my future. Now I’m a leader. My advice to the younger ones is to stay focused, keep a positive attitude and always think about your future. Getting your education, that’s the key to all the doors in your future,” he said. And while Stanfield is happy to open the door for the Kerionnes of the neighborhood anytime, it’s his long-term goal that he’ll eventually no longer be needed. That is when he’ll know that he really belongs on Success Street.